ADLINGTON HALL near Macclesfield, Cheshire, was orginally built as a Hunting lodge before the Norman Conquest and early in the thirteenth century it was granted to the Norman family of "de Corona". In 1315 Thomas de Corona gave Adlington to his sister Ellen and her husband for the remainder of their lives, thence passing to Robert de Legh, their second son, and his heirs for ever. The Legh family has lived at Adlington since this date. During this period of almost seven hundred years Adlington Hall has been added to and altered by successive Leghs, and of the original Hunting Lodge nothing remains, except for the two oak trees around which it was built, and which today stand at the east of the Great Hall (built between 1450 and 1505). The greater part of the house was constructed in 1581 in the half timbered black and white Cheshire style, and can be seen on the right of the photo. The house was considerably added to in the late seventeenth and mid eighteenth centuries in Georgian style as its main front is seen today. Adlington Hall, still the home of the Legh family, is an interesting example of a small country manor, having many old furnishings and paintings going back to the sixteenth century. 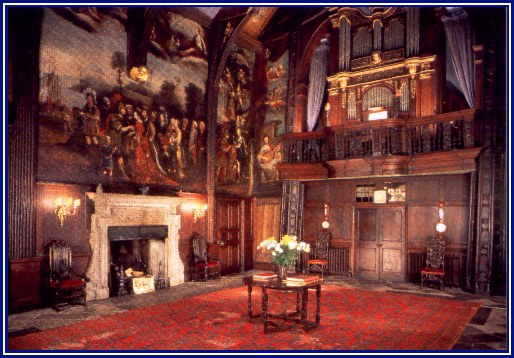 One of Adlington Hall's most interesting and historic possessions is the organ in the Great Hall, standing in the balcony supported at each end by the two original oak trees, their roots still in the ground. 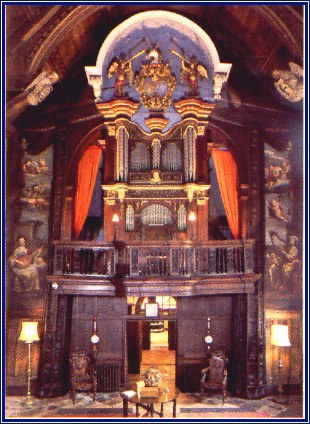 It is one of the finest examples of a large seventeenth century organ in Britain as well as being one of the oldest. Being virtually unaltered since it was built, it now re-creates the authentic sounds of its day. The organ was built in about 1670 by Bernard Smith, formerly Schmidt, who was, like Handel, a native of Halle. Smith was to become the most successful British organ builder of his time, with instruments such as those in Westminster Abbey, St Paul's Cathedral, Durham Cathedral and many others to his credit. GREAT ORGAN Opn Diopason 8, St Diopason 8, Principall 4, Twelfth 2b, Bl Flute Bas 2, Bl Flute Trib 2, Fifteenth 2, Ters 1d, Sm Twelfth 1a, 2 & Twenty 1. CHOIR ORGAN St Diopason 8 (borrowed from the Great), St Flute 4, Bassoon 8, Vox Humana 8, Trumpet 8. George Frideric Handel was born at Halle, in upper Saxony, in February 1685. He arrived in England for the first time in the winter of 1710. "The report of his uncommon abilities had been conveyed to England before his arrival and through various channels. Some persons here had seen him in Italy, and others during his residence at Hanover. 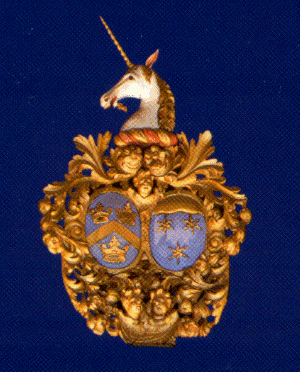 He was soon introduced at Court, and honoured with marks of the Queen's favour." Where, or at what date any of the Legh family first met Handel is not known, but Elizabeth, the daughter of John and Lady Isabella Legh and the elder sister of Charles was a very keen amateur musician and a most competent player upon the harpsichord. She appears to have visited London frequently from 1718 onwards; her father was from 1714-1722 one of the two Members of Parliament for Bodmin. There isconsiderable evidence of her admiration for Handel, and it seems highly likely that she received harpsichord lessons at his hands. Elizabeth Legh was a subscriber for the second volume of Cluer & Creakes' Pocket Companion, published on 22nd December 1725. This volume contains thirty-six songs, twenty-seven of which are from Handel's operas. The list of subscribers is headed "Persons of Quality, Gentry & Others, who are Subscribers to & Encouragers of this New Method of Engraving & Printing Musick in Pocket Volumes." Elizabeth was also one of the fifty-eight subscribers for Scipione (27th May 1726), one of the eighty subscribers for the score of Alessandro (6th August 1726), and one of the fifty-seven subscribers for Admeto (24th June 1727). In January 1727 London socialite Mrs Pendarves, who had known Handel since 1711, when writing to her sister Ann Granville said: "Mrs Legh is transported with joy at living once more in 'dear London', and hearing Mr Handel's opera performed by Faustina, Cuzzoni and Senesino (which was rehearsed yesterday for the first time) that she is out of her senses . . Miss Legh is fallen in love with the Basilisk, and says he is the most charming man of the world; he happened to commend Handel, and won her heart at once." The opera in rehearsal was Admeto. "Basilisk" was the nickname of Lord Baltimore. John Lockman in his second introductory essay to the Word-Book of his Musical Drama Rosalinda, set to music by John Christopher Smith (and performed on 4th January 1740) tells of Elizabeth Legh in the following story: . . . "Among the many Things I have been told, I shall mention but one; to which the Author of the Music of the following Drama was, among other Persons, an Eye-witness. It relates to a Pigeon in the Dove-house of Mr Legh in Cheshire. That gentleman had a Daughter who was extremely fond of Music, and a very fine performer on the Harpsichord. The Dove-house was built not far from the Parlour, where the musical Instrument stood. The Pigeon, whenever the young Lady play'd any Air, except Spera si in Otho (by Handel) never stirred; but as soon as that Air was touched, it would fly from the Dove-house to the Window; there discover the most pleasing Emotions; and the Instant the Air was over, fly back again. The young Lady was so delighted with the Fancy, that she ever after called Spera si The Pigeon's Air, and wrote it under that Title in her Music-book. . . ."
John Christopher Smith, the author of the music for Rosalinda and an eye-witness to this charming story, was Handel's pupil and later his Treasurer and copyist. His father, a former University friend of Handel's came over to England with his young son in 1716. Whether or not Handel himself stayed at Adlington during the lifetime of Elizabeth Legh is not certain, for she died aged forty and unmarried in 1734 and is buried in Westminster Abbey. That he was a guest at Adlington in 1741-1742 is virtually certain, either on his way to Dublin for the Messiah or on his return. At this date Charles Legh had succeeded his Father, and became a firm friend of Handel. In 1748 Handel is said to have played the organ at Poynton Church. This organ was built by Glyn & Parker; the Church was pulled down in 1858. Handel would surely have been aware of his co-patriot from Halle, Bernard Smith, of his fame as an organ-builder in England, and of the Bernard Smith organ at Adlington. 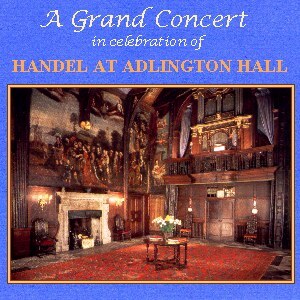 We may safely assume therefore, that the Adlington organ would have been played by Handel, both for his own edification, and for the enjoyment of his hosts. To the musical notes of the merry mouth'd hounds. Such harmony Handel himself never knew. This Hunting Song was first set to music by Mr Ridley, the Organist at Prestbury. Four years later it was set by Handel himself and the autograph, "Presented by him in this his own hand Writing to Charles Legh Esqr in the year 1751", is still at Adlington. We have not so much as a moment to spare. For the musical song of the merry mouthed Hounds. Among Handel's keyboard works are two sets of eight harpsichord suites. The composer was acting as music-master to the King's daughters when he published his first set of suites "pour le clavecin". Though the publication date was 1720, sketches for some of the movements were made as far back as 1705. In a preface Handel stated that he had published them "because Surreptitious and incorrect copies of them had got abroad." It is likely that Elizabeth Legh also was a music student under Handel during the 1720s; in any case, as a keen harpsichord-player and firm admirer of Handel, she would cerainly have been thoroughly familiar with these Suites. There is a tradition that Handel composed the "Harmonious Blacksmith" whilst staying at Adlington and that the autograph was there until the turn of the last century. It is at Adlington no longer and so far as is known there is no extant autograph in existence. Bernard Smith organ, 1670, in the Great Hall Gallery. 12. Tenor Aria: Spera si in Otho � the "Pigeon's Air"
Click picture at left for full details and music samples.